If you are out celebrating this Cinco de Mayo, we encourage you to have a plan for how you’ll get home safely. You can designate a sober driver, arrange to have someone pick you up, or hail a cab on us. The firm will pick up a tab for any Yellow Cab or City Cab ride, as long as the passengers are headed home—the free ride is not available from a bar or restaurant to another drinking establishment. Colorado Springs. Call Yellow Cab of Colorado Springs at (719) 777-7777. Pueblo & Pueblo West. 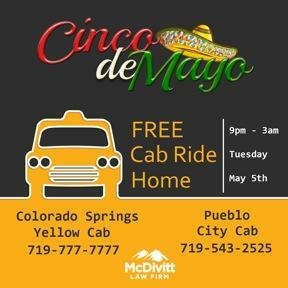 Call City Cab of Pueblo at (719) 543-2525.